The kabbalists teach that the most important consciousness to have is that of certainty. They make it clear that no matter what actions we do, if we are not able to develop our certainty in the Light of the Creator, we will not be able to continuously draw greater and greater blessings into our life. 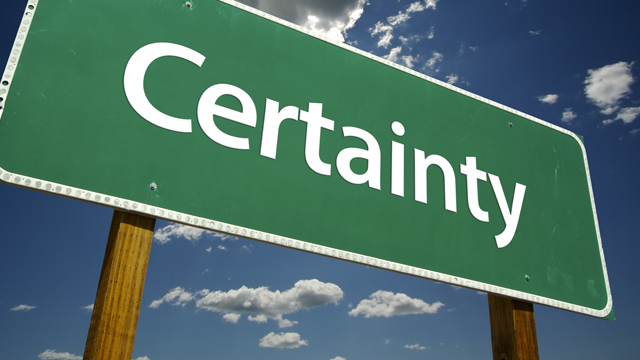 Certainty is a relatively simple concept to speak about. Certainty means having the knowledge that absolutely everything that occurs in our lives - from the smallest things to the greatest - is coming from the Light of the Creator, and is ultimately for our benefit. Even in situations that seem to be chaotic and that we do not wish to occur, certainty is having the understanding that absolutely everything that happens is coming from the Light of the Creator, and is therefore for our ultimate good. Why is certainty so important? The kabbalists explain that for every blessing, for every level of Light that we desire to draw into our lives, there has to be what’s called the vessel, a place into which you can draw that Light. And they say that the greatest vessel is certainty, because when a person has certainty, he is completely united and bonded with the Light of the Creator; therefore, the Light can flow more quickly and easily to that individual. On the other hand, the kabbalists teach that when a person’s life and consciousness is filled with doubt and worry, then that doubt or worry literally breaks the individual’s bond and connection with the Light of the Creator. And as such, even if there were blessings that were meant to manifest and come into this person’s life, the awakening of doubt and uncertainty separates the individual both from the Light of the Creator and the blessings that were meant to manifest in his or her life. It’s an amazing realization: every single one of us has many more blessings that have been prepared and are ready to manifest than we actually receive. But because we still live in a certain degree of doubt, uncertainty, and worry, we actually block the Light of the Creator from manifesting those blessings in our life. So what do you do? The answer is very simple. You have to practice certainty, from the smallest to the greatest. You might be driving home and somebody cuts you off. Your natural inclination is to say: This is simply a bit of chaos in my day for no reason, and I’m going to become angry about it. Or, the other way to view it is: This is coming from the Light of the Creator and there’s something here that is to my benefit and I accept it in that way. I’m not angry about it. I’m actually happy about it. Only if an individual consistently practices certainty, from one instance to another, can real certainty grow. Every day, there are at least 10 or 15 moments when we can choose - are we getting worried and full of doubt, or is it coming from the Light of the Creator? I just heard that somebody said something about me. I think somebody might be thinking something bad about me. Is that simply chaos? Or can you know without a doubt it is to your ultimate benefit, so you accept it and enjoy it? Only if we are growing in this consciousness, practicing it moment after moment, day after day, do we have the ability to grow our certainty in the Light of the Creator. And by growing that certainty in the Light of the Creator, we grow our ability to receive and manifest the great blessings that the Light of the Creator desires and has prepared to manifest into our lives. Therefore, the kabbalists teach that one of the most important spiritual practices is that of certainty. Out of the 10 opportunities that we have on any given day to choose if something is happening to us chaotically, or if it is coming from the Light of the Creator, we have to choose to have the consciousness of certainty over chaos, time after time after time. If, and only if, we are practicing and growing with our certainty can we be sure that the ultimate blessings we desire will manifest quickly and completely into our lives.